Sunday is meal prepping time for me and it is truly my favorite because I get inspired and very creative. The excitement builds up on Saturday when I create my menu for the week and go shopping for the items. But I have to admit that some Sundays I can’t get motivated so I do the next best thing, I take shortcuts. Frozen potatoes are a time saver. No need to peel, soak or cut up. Make sure when you purchase frozen potatoes that there are no funky additives or ingredients. I load up on a lot of the vegetables in the pan with 1 tablespoon of oil and don’t be shy about over doing it with the veggies. When you think 10 mushrooms are enough, go ahead and add 5 more. I also use the sweet mini peppers instead of the big ones because you never have any left over and forgotten peppers in the fridge and if you feel bold, go ahead and add a few slices of jalapenos. I did not feel bold so I skipped the jalapenos. Once the vegetables are cooked as indicated by the translucency of the onions and the size of the mushrooms, remove from the pan and set aside. Leave the bits of vegetables in the pan and go ahead and add the butter and oil. I don’t know about you but I always see chefs adding the seasonings on top of the food while they are cooking. I prefer adding all of my spices in a bowl with my potatoes and mixing it all together to make sure I get an even coating and I let it rest for a few minutes, then I add it to the hot pan. Just make sure the oil/butter combination is not smoking since it will give the potatoes a bitter taste. So after the potatoes are a light brown color go ahead and add the mushroom and onion mixture back into the pan and start mixing it all together. At this point I tend to put in my hemp and flax seeds as well as nutritional yeast and several dashes of Kelp for added iodine since I don’t use salt with iodine. Once everything is combined I just take it off the heat and add the Daiya Shredded cheese and place a cover over the pan for a few minutes. I have to give a shout out to Daiya for their new updated recipe. It melts just like the real thing and tastes very close to it too. And at the end, you will have a big batch of deliciousness for the whole week. I always add some sriracha. Pair it with some seasonal fruit and trust me you will be satisfied until lunch time. 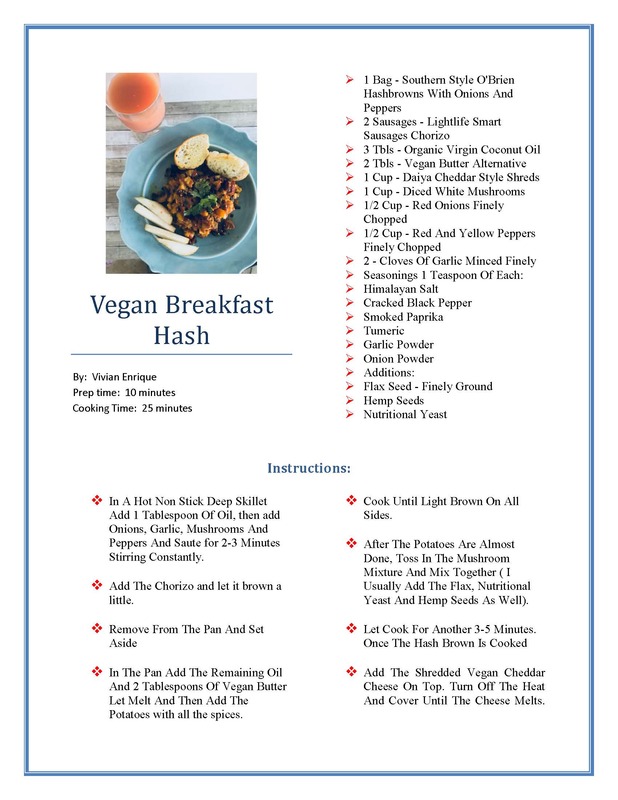 Let me know if you have tried it or what you do differently to your hash browns.